Hello there! 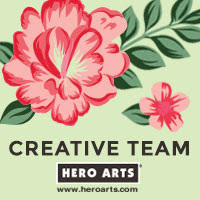 Today we are celebrating the release of the June 2018 My Monthly Hero Kit from Hero Arts. 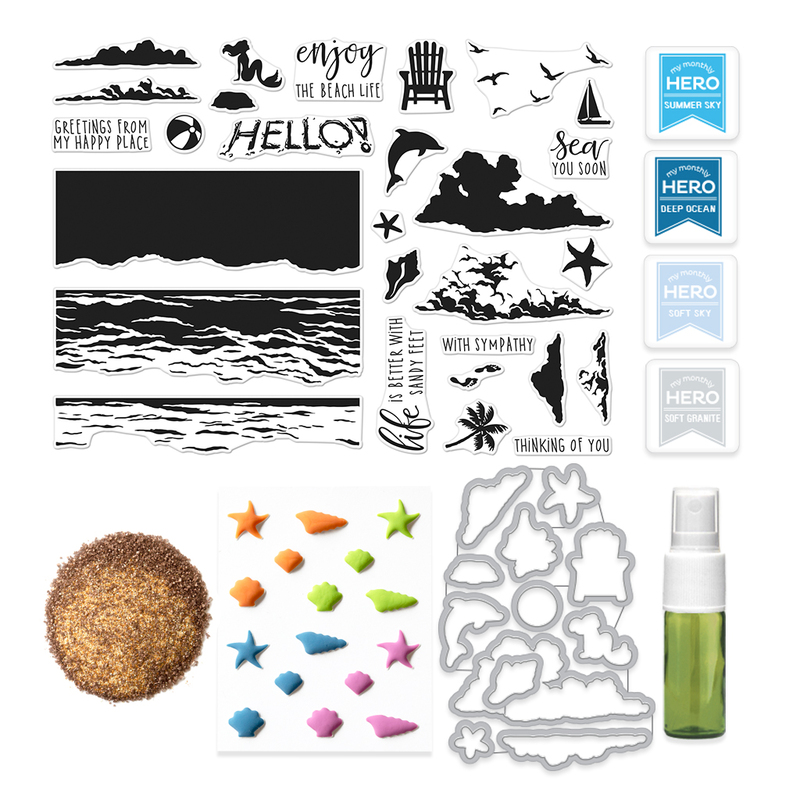 It is a wonderful kit with a beach theme that is especially great for summer cards but I think can be used for other occasions too. If you are following along in the hop, you should have arrived here from the fabulous Yana, but if you get lost along the way, the full list of participants is below. I wanted to do something a little different from my card than create a beach scene, so I went for a sunset scene instead. I love palm trees and as soon as I saw one in the main kit stamp set, I knew I wanted to use it. I started off by creating the sunset background. I took a piece of Bristol paper and added a circle mask that was cut using one of the Nesting Circle Infinity Dies. I then applied Hero Arts Inks to the panel with a blending tool. I used Dandelion, Tangerine, Strawberry, Orchid and Grape Juice inks. I removed the mask and blended over more inks to create the sun. I took the palm tree image from the stamp set and stamped this repeatedly on the panel using black ink. I set the piece aside to dry for a little while and then extended the tree trunks with a black pen to get the height that I wanted. This panel was then added to a black A2 card base with tape runner. I took a panel of black cardstock and stamped one of the sentiments from the set on to it using Versamark Ink. I applied white detail embossing powder and heat set. The panel was then added to the card base with black foam sheet and DST. 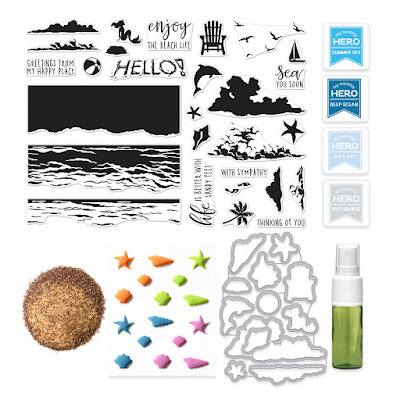 The June 2018 My Monthly Hero Kit contains a 6" x 8" clear stamp set, 12 coordinating frame cuts, 4 ink cubes (Deep Ocean, Summer Sky, Soft Sky, Soft Granite), sand embossing powder, Sea Foam shimmer spray and beach enamel stickers. The kit contents value at $72 but you can get it for an amazing $34.99 (approx. £27 depending on exchange rate). 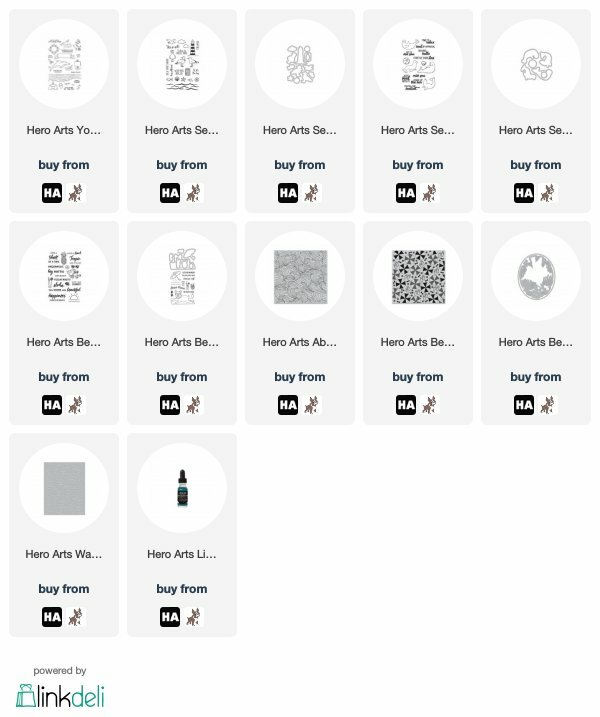 Hero Arts are giving away one kit to one lucky blog reader - selected from the comments left across all stops in the hop. The giveaway closes Sunday June 10th at 11.59pm EST. The winner will be announced the following week on the Hero Arts Blog. Good Luck! Thank you so much for visiting me today. As you can see, I am the last stop in the hop but I hope you have had a fabulous time looking at all of the wonderful inspiration. Have a great day! Lovely sunset card. Beautiful colors. Lovely sunset scene and I love that you showed another way to use the kit! What a great kit and beautiful card. Wow, beautiful tropical CAS card, LOVE! Love the beautiful beach sunset scene you created; wish I was on that beach right now!! TFS! Wonderful card! And a wonderful kit! I live by the shore, and I'm always trying to make realistic looking waves on cards and layouts - these stamps are perfect! I love palm trees too. Beautiful card. Man I wish I was in that happy place, great card! Fantastic card! Love the scene you built! That is a beautiful sunset. This kit is wonderful! This is my favorite Hero Arts kit EVER! I have already placed an order for myself and my daughter. I can't wait to get my hands on it and play with it. The kit contents seem so well thought out. Looking forward to trying out the sand embossing powder. I love all the sentiments too! Your sunset scene is so striking! Your blended background is great! Very different from your normal style but I love it! Your cards are amazing; you are so talented. This kit is right up my alley; I love summertime. 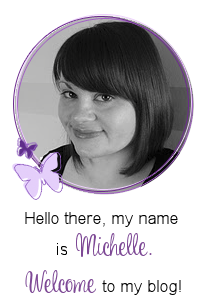 Nice work, Michelle! 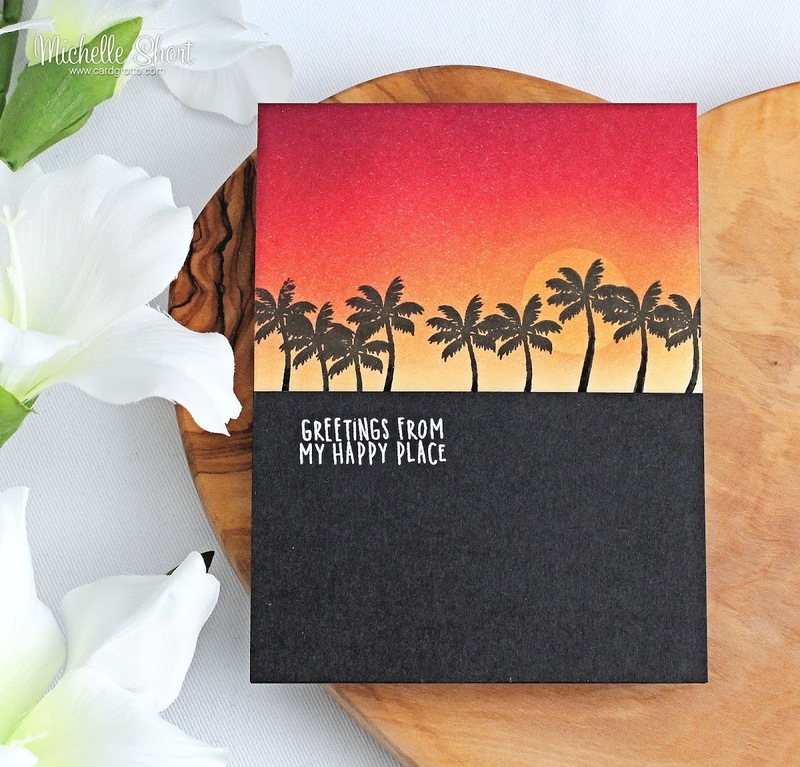 Beautiful tropical sunset card! Thanks for sharing! Beautiful card. I love the clean and simple design and the contrast of that white embossed sentiment. Looking at those palm trees makes me want to head to the beach right now!! Awesome card with a beautiful sunset! Thank you for sharing! Michelle love your card since the beach is my happy place too! Such a pretty card! I love that blended background! Beautifully blended "classic" beach sunset - great job! Lovely cards!! I love this new kit!! So pretty, Michelle! Gorgeous colors for your sunset! This is my absolute favorite HA kit. So sad I missed out on it! Thanks for the chance to win one! This kit makes great beach scenes, and now this wonderful sunset shows an entire new way of using it. Lovely! Thank you for sharing with us such lovely creation! your ideas + this kit = amazing. would love to win this.. sold out..
Just gorgeous and a nice change from all the beach/sand scenes we've seen thus far as samples!!! Nice job!!! Love love love the card. The sunset is amazing. Your card is stunning! I love how versatile this kit is. Michelle, you may be the last...but you clearly didn't disappoint...the very reason to finish the hop...you get inspiration down to the very end! Your sunset is so amazing! Beautiful cards!! Color combinations is amazing! Wow! I love how you went a different way and showed us that you can do more than just ocean scenes with the kit. I love the colours you used! Love the sunset! Thanks for the inspiration. What a STUNNING card, so UNIQUE, I love that it is different then what we have seen today and it is absolutely AMAZING!!! The sunset is just so real like, you nailed it girl, like WOW, I LOVE your card and Thanks for sharing with us, great post. Beautiful sunset scene and colors! Love it! I love all of the new Ideas! Everything is so beautiful! Gorgeous card. Your sunset is amazing. What a gorgeous card! I love your sunset sky! Just love your sunset! Perfect colors and card! Thanks for sharing! Your card is awesome and so is this kit! Sure hope I win it! What great colors. Love your card. So many great ideas!! my happy place is the beach! your cards are great. Your card is beautiful ! Great card. It shows off the palm tree stamp which the other cards in the blog hadn’t. 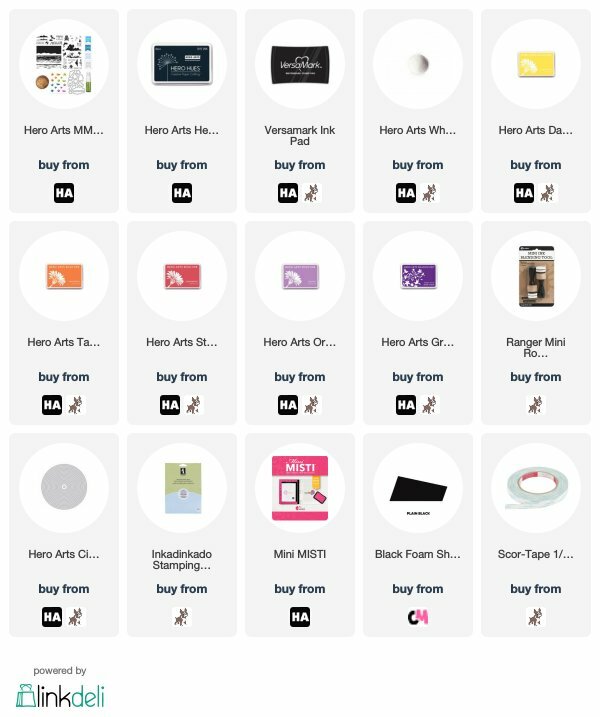 Your card is beautiful and it was a fun and inspiring hop. This is amazing! This kit looks excellent, great cards! What a terrific card you made! Love the colors you chose for sunset! Gorgeous!! I feel it, standing on a Hawaiian beach watching the sunset. Ah, sunset. My favorite time of day. Thank you for sharing. What a fun sunset! Love your colors. Great cards! I love the sunset. Thank you for the inspiration! Lovely sunset - so stunning! Wow, gorgeous sunset! Fantastic card. i want to be on a beach with the view in your card and not in my office taking a break and commenting on your blog post! Beautiful sunset. It makes me long for days long past. Such a beautiful sunset and I like how original this card is very unique and pretty. Beautiful card! I love your sunset sky! I love the simple beauty of the scene you created Michelle. This is so pretty, well done! Michelle I love the sunset card. Really nice! Really beautiful work!! I enjoyed it and got some great ideas! Thank you! Oh wow !! That’s such a wonderful card ! Your sky/background is absolutely perfect !! Wonderful cards love the anchors. Love your colours and use of silhouette stamping! Beautiful and I have pinned for future inspiration! Your "happy place" is lovely! Love, love, love this. Who wouldn't be happy there? What an amazing kit. Wow this is fabulous card. Loved this hop. Just sad that I did not get the kit on time. Beautiful card and yes, my happy place, too!! TFS. Great card! This is such a great summer release!! I love all the stamp sets! Thanks for sharing! Your sunset is gorgeous! This is very pretty! Lovely sunset with the palm trees! Wonderful design. I love this kit! Simply stunning!!! I love this card and can’t wait to get my kit so I can try to recreate it!! Thanks for sharing your process!! Absolutely stunning card! I looove it! Stunning card! Looks like a picture...just beautiful! Love the silhouettes of the palm trees. 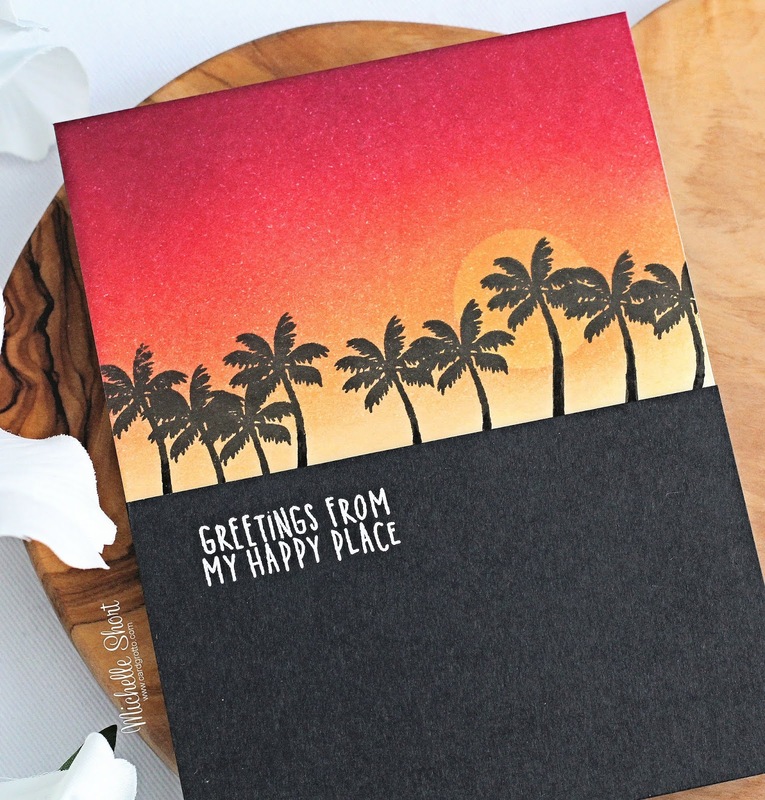 Lovely sunset card--I want to go there now! My happy place too. I LOVE this kit! Tried to buy it, but it's gone. What a gorgeous vivid card. Thanks for the inspiration! Just bought my Happy Place’ in FL. The card is perfect. Thanks for sharing. Such a lovely card. And this kit is amazing! Gorgeous!! I love this kit! This scene is amazing. The colours are so lovely and just perfect for a cool sunset.